My grandparents marched and danced with a group called the Green Garter Brigade for, oh, maybe ten years or so. It was always fun (in younger years) to be huddled up under our blankets eating pretzel rods and an inappopriate amount of cookies waiting for them to pass by in the parade. Here are some shots of me from my second 2nd Pat's Day, jamming to Irish tunes on the front porch. 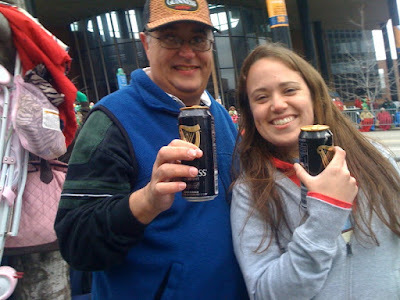 Dad and I enjoying a Guiness! I don't think St. Patrick intended green beer, shamrock headbands, and excessive beads as celebration of his patron saint-ness, but, well, it sure is fun. My family has been celebrating in the exact same way since prior to my own birth. It was lovely to be a part of this year. 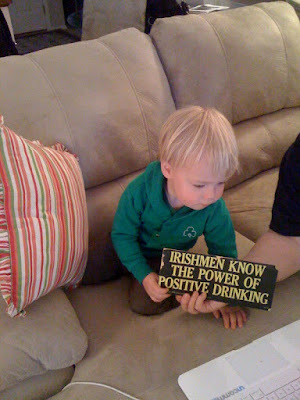 Happy St. Pats. Go put your green on. I LOVE St. Pats! And uh.. Nater looks JUST LIKE YOU in those pics! Bananas!!! seriously, nate is a little you. Glad to see you this past weekend. i cannot get over how much your baby photos look like nate.